There seems to be a common breach of etiquette these days. Many people are running around, assuming they are friendly, yet crossing lines that should never be crossed. While I understand curiosity, there’s a level of human decency that seems to be missing. Or at least a little common sense. Apparently I’m covered in braille. Maybe a slight exaggeration, but that’s the only conclusion I can come to. Truly, tattoos are no longer something that are just viewed, but they must be touched. When I decided to start getting tattoos, no one warned me about this particular side-effect. Maybe it was in the fine-print of the waiver I signed before getting inked? I will never forget a visit to the grocery store when a woman approached me from behind. Apparently my tattoo had some magnetic power that drew her in because, before I saw her, she had literally grabbed the sleeve of my t-shirt and started pulling it up to see more of my ink. I’ve pondered this exact moment, and tried to put myself in her shoes. Tried to understand why?! But I can’t. I cannot comprehend how that would register in someone’s mind as an acceptable action. 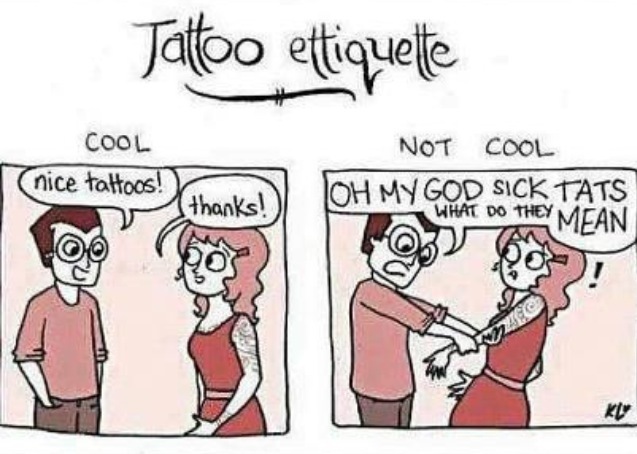 I’m not sure I understand how people can miss the concept of a tattoo still being part of a person’s body. But it is! Once while attending a concert, the girl next to me literally put her nose within an inch of my wrist to view the script. She never spoke to me, but for several minutes, no matter where my arm moved, she followed. While I would typically be put-off by someone intruding into my personal space in such an odd fashion, I found humor in her annoying behavior. She honestly looked like a complete fool for the duration of her viewing (which other people around us had even begun to notice!). But really people, how hard is it to understand the concept that groping strangers is unacceptable behavior? If you’re curious about the ink, ask. Most people will tell you about it, or they’ll tell you it’s personal. Simple. Have tattoos? Hate tattoos? Want to get a tattoo of the Mona Lisa? Posted in art, frustration, humor, laughs, life, nonsense, randomTagged art, etiquette, humor, ink, issues, laughs, life, mona lisa, random, rant, tattoosBookmark the permalink. I have to admit at first I was put off by tattoos on women. However they have grown on me. In fact I want to get one myself. I cannot imagine some stranger touching me like that. Wow you have restraint Jaklyn . I still dont like the one on my daughters beautiful chest. She recently told me she wants to have it covered. It’s funny how we can get used to things we once disliked, then eventually admire them. see also touching pregnant women’s belly’s…. I have had similar experiences… but it’s been more from my students, so it’s not totally as awkward as strangers. People are just plain freaky sometimes. Good of you to keep your composure in these instances. Good, perhaps. Easy? Not. At. All.